Halloween is all about embracing your inner child, being whoever you want to be for one day, celebrating ancient traditions, having fun with your besties and family, and of course, lots of treats! Many people absolutely love Halloween, waiting patiently all year for the one special day. For those people, the idea of having another especially special day, their wedding, on Halloween would make their wedding that much more special. After all, weddings are all about celebrating ancient traditions, embracing your love for your significant other, celebrating that love with your besties and family, all in one special day. See a resemblance? Well, one of our Roo Girls, Cori, loves Halloween more than any other holiday. So, when it came time to celebrate her wedding day, she made it extra special by having a Halloween wedding! Since October 31st fell on a Saturday in 2015, having a Halloween wedding couldn't have been any more perfect. It was an absolutely BOOtiful wedding, from the Sherri Hill bridesmaid dresses, to the Mon Cheri Bridal flower girl dress, to the hair and makeup, flowers, desert, and photography. 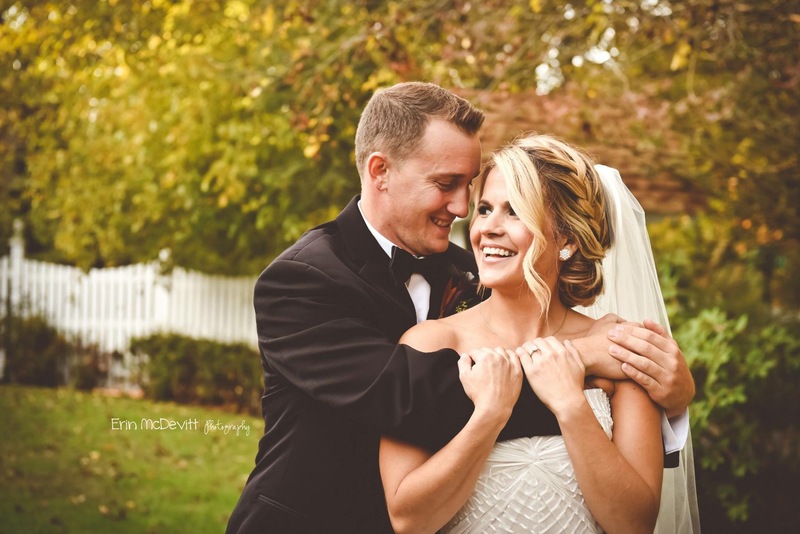 The wedding took place at Rams Head Inn in Galloway, NJ, which was the perfect setting for a fall wedding. Check out all the details of the spooktacular wedding below. 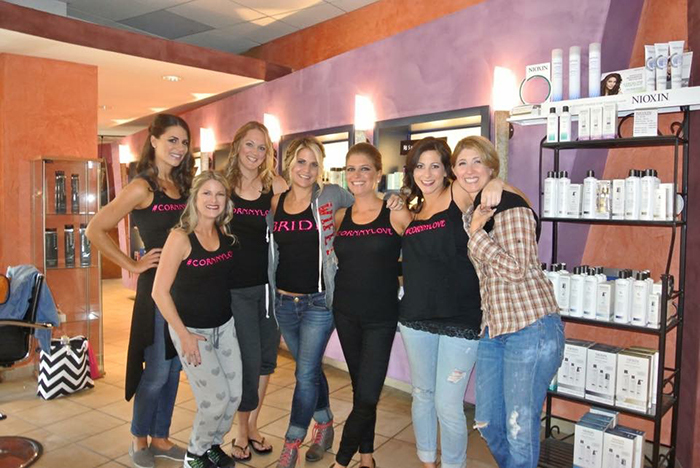 Cori and her bridesmaids got ready for Cori's big wedding day at Esthetica Salon and Spa in Northfield, NJ. They got their hair and make-up done and were off to put on their dresses. See the special tanktops all of the bridesmaids wore? They all have the hashtag of Cori's wedding on them - #CORNNYLOVE, which isn't only a play on candy corn for Halloween, but is the combination of Cori and her husband's name, Johnny. Cori chose a beautiful layered and patterned white strapless bridal dress. We especially loved the jeweled waist band around the dress - a perfect way to add a touch of sparkle! While Cori went the traditional white bridal dress route, it's also common for brides to wear non-traditional dress colors for Halloween weddings, like black, grey, or red. Having a Halloween wedding (and any wedding, for that matter) is all about choosing a dress that you feel confident and comfortable in, so choose a dress that fits you best! Since Cori went with white for her bridal dress, she had her bridesmaids rock black bridesmaids dresses that she got at RissyRoos.com to bring in a touch of Halloween color to the bridal party. They wore Sherri Hill style 32084, a fierce and fabulous ball gown with a strapless sweetheart beaded bodice and a long flowing satin ball gown skirt. 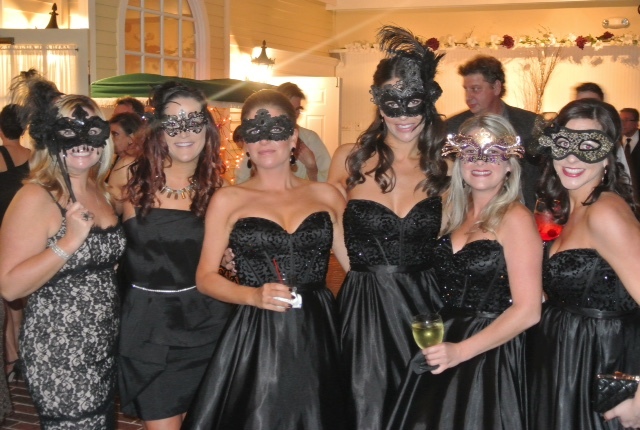 The theme for Cori's wedding was a Masquerade Ball, so the Sherri Hill black ball gown was not only important for rocking Halloween colors, but to set the black tie masquerade vibe of the wedding. 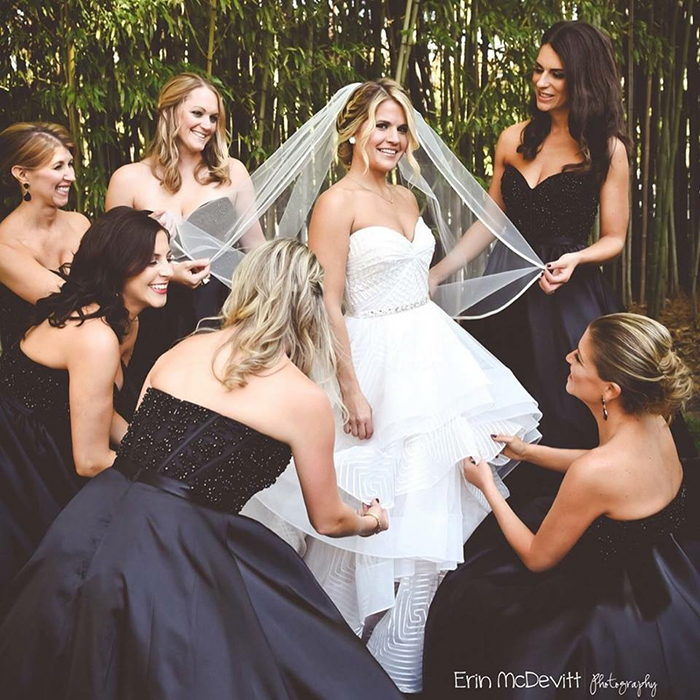 Choosing black dresses and suits for the bridal party, with both the bride and flower girl in white dresses, kept the entire look so elegant and perfect for pictures. The only way you can tell that the party was a Masquerade Halloween themed wedding is if you were at the party! Perfect for still having classic pictures to share with others. The tuxes were from Sharp Cleaners Tuxedos in Ocean City, NJ. The flower girl also wore a dress from RissyRoos.com, one by famous dress designer Mon Cheri Bridals! While the dress was white, she wore a black ribbon around her waist and carried a basket with black and purple ribbons wrapped around the handle. It was all about just the right amount of touch of Halloween at Cori's wedding. Even though the bride and groom were in traditional wedding attire, Cori and Johnny still rocked a touch of Halloween! Cori wore funky heels (see a close-up picture below), and Johnny rocked orange and black striped socks. 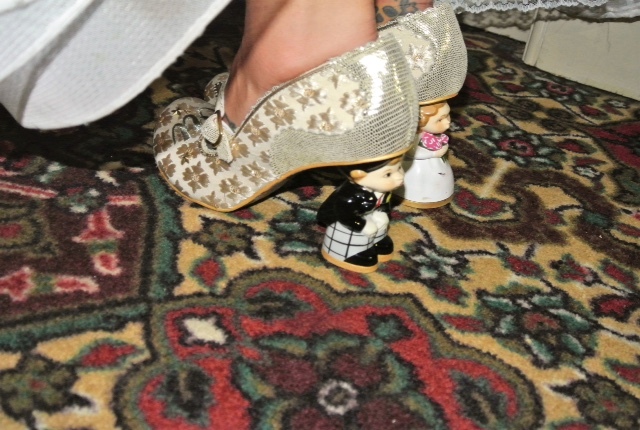 How cute and funky are Cori's bridal high heels?! We're in love with this totally unique idea - so fun, but still classy! Cori's and the bridemaid's flowers also had a hint of Halloween. The flowers chosen were very fall inspired, even with leaves included in the bouquet. 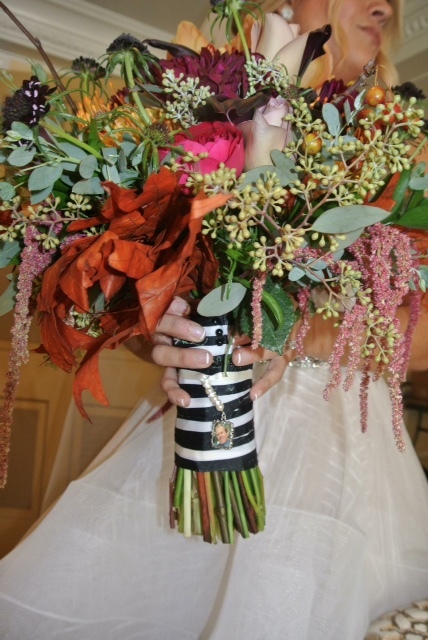 The bouquet was wrapped in black and white striped ribbon. Beetlejuice, anyone?! The beautiful bride and bridesmaid bouquets were put together by Pocket Full of Posies Florist in Galloway, NJ. The Halloween wedding was masquerade themed, so the guests didn't need to bring anything to have some Halloween fun - all of the masquerade masks were provided at the wedding party! It's a simple and easy to way to make sure everyone can join in on the fun at a Halloween wedding. 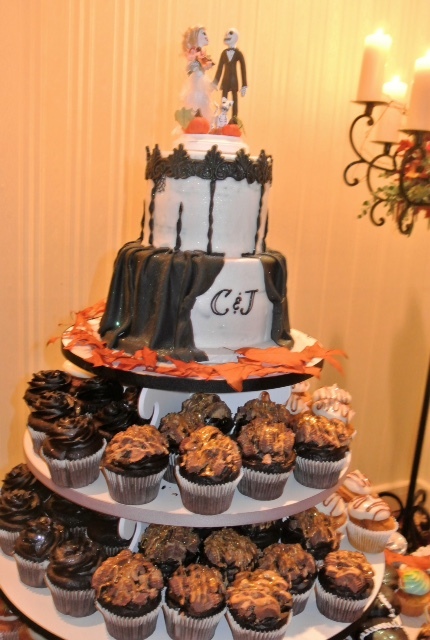 Even the wedding cake was Halloween themed! The bride and groom cake topper were cute skeletons... even their cat, Chicken, was represented on the top of the wedding cake with a skeleton kitty! The orange and black icing cupcakes, made by Simply Sweet Cupcakes in Egg Harbor City, NJ, topped off the whole look. 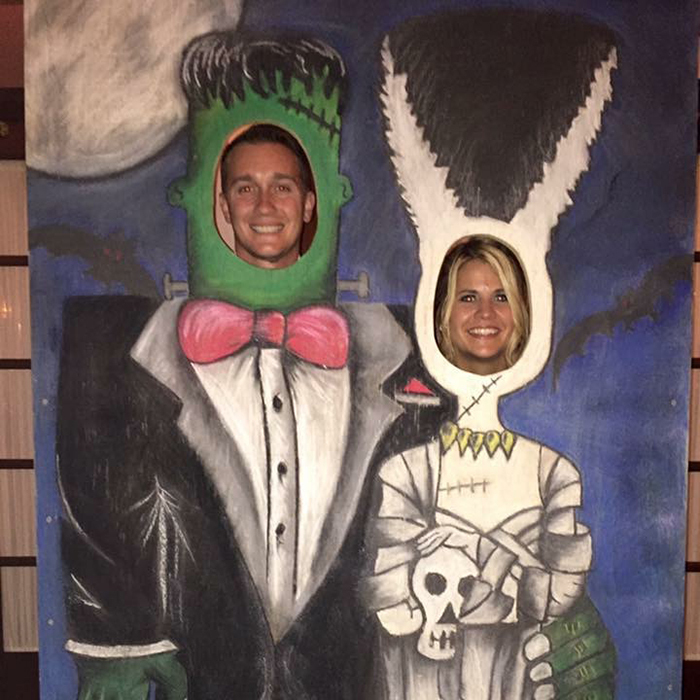 Johnny and Cori had a truly spooktacular wedding! We hope they had as much fun, and made as many memories, as we had looking at their photos! The beautiful wedding pictures were taken by Erin McDevitt Photography in Ventnor City, NJ. So beautiful!! Congratulations to the beautiful couple!! Many years of fun Halloweens to come! This entry was posted in Weddings, Fall and tagged wedding dress, fall, Wedding, Wedding Dresses, Wedding Gown, halloween, wedding tips, wedding planning on November 6, 2015 by Chrissy Roos. Just about every little girl (and woman!) dreams of a Disney princess inspired wedding. From the wedding dress, to the cake, to the bridesmaid dresses, to the location...it's definitely a hard dream to pull off in real life! 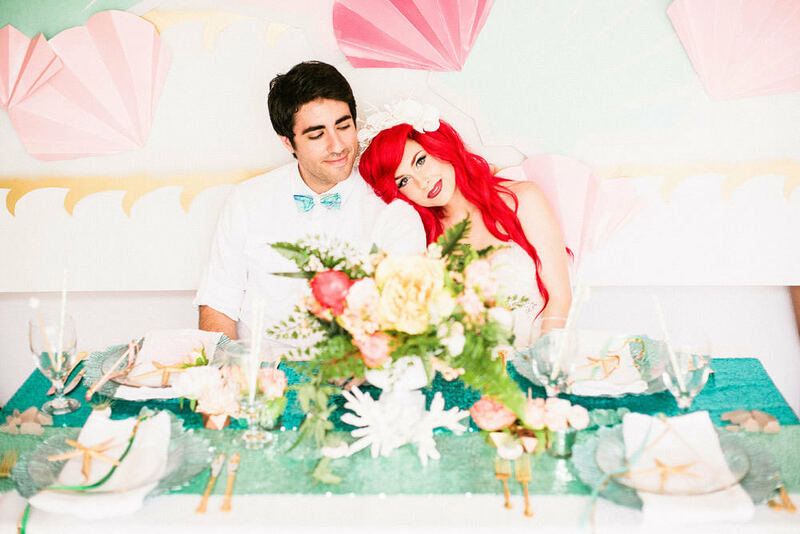 Well, online wedding marketplace Your Cloud Parade recently teamed up with singer and designer Traci Hines to bring one Disney princess childhood dream to life with a wedding photo shoot inspired by the Disney movie The Little Mermaid! Traci played the role of mermaid bride Ariel, while model Leo Camacho played the groom, Prince Eric! Check out some of the photos from the fake wedding shoot below. Plus... if you are totally obsessing over Traci's Little Mermaid formal look, don't fret - we have two gowns you can rock that are perfect to wear for Prom or your own The Little Mermaid themed wedding! So obsessed with the bright red hair! 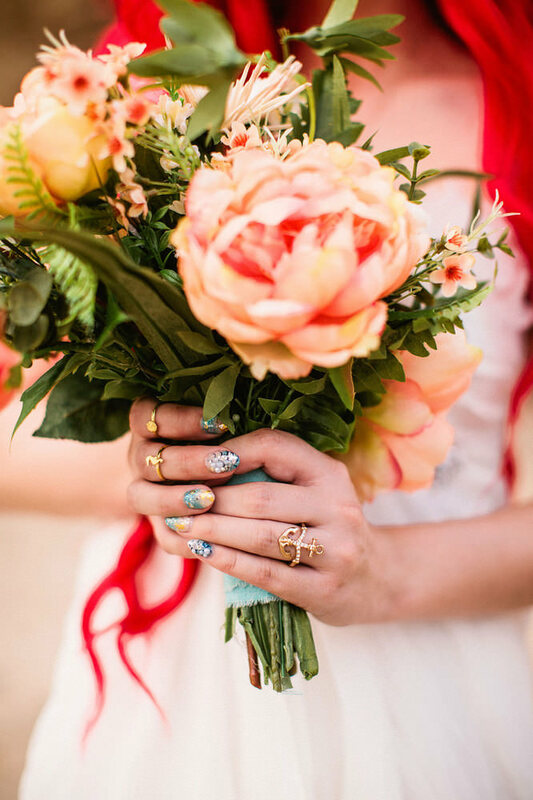 Such perfect nails and rings for a Little Mermaid! 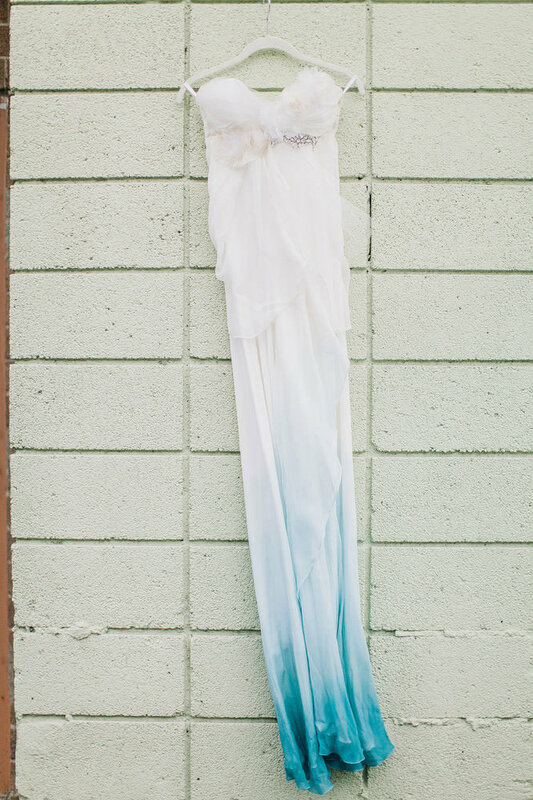 The white to aqua ombre dress reminds us of Ariel's fins! What a perfect idea! This couldn't be a more perfect scene for a mermaid princess! Want to see more photos from this gorgeous (faux) wedding? Check out The Huffington Post's article. You can see everything from the cake, to a close-up of the bridesmaid outfits, to the finger foods. It's all too cute! Ready to see how you can get this look for your own formal event? Check out our two favorite ombre dresses below to rock Ariel's look! La Femme style 19549 has the opposite ombre pattern of Ariel's (aqua to white, rather than white to aqua), but the dress reminds us so much of the ocean and mermaids that it's one of our favorites to steal Ariel's look. This chiffon gown has a criss cross ruched bodice that reminds us of Ariel's bikini top from the movie. The sides and back are detailed with gorgeous stone covered mesh and lace for just the right amount of glam for a mermaid. This look is great for a Little Mermaid look for Homecoming or Prom. For a white top to aqua bottom ombre look just like Ariel's, go with Dave and Johnny style 10064. It's a long chiffon ombre gown with beaded straps and a sweetheart beaded neckline. This look is perfect for a sea inspired dress, while still rocking the traditional white for a wedding. 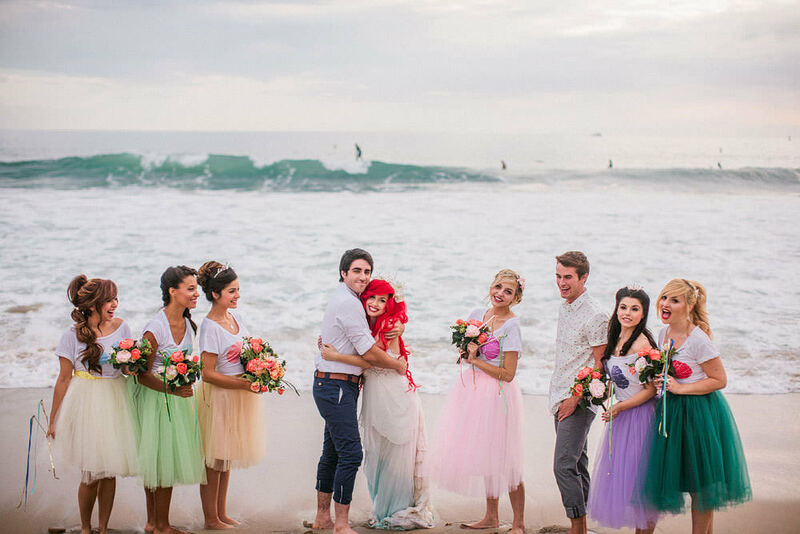 Are you loving these The Little Mermaid wedding pictures as much as we are? Remember, this is all a faux wedding, so don't get too jealous! Plus... it's so easy to get the looks yourself, so don't be afraid to go for it for your next formal event. This entry was posted in Movies, Weddings, In The News, Prom Dresses and tagged Prom Dresses, La Femme, Prom, Disney, Prom dress, wedding dress, Disney Style, Disney Princess Dress, Wedding, Wedding Dresses, Wedding Gown, Dave & Johnny, Prom 2015 on October 28, 2014 by Chrissy Roos.